The 7th Philippine Business and Entrepreneurs' Expo at the SM Megamall Megatrade Hall 1 has just finished its run last weekend. Aside from the exhibit, the 7th PBEX is filled and here are the five takeaways from the event's conferences. 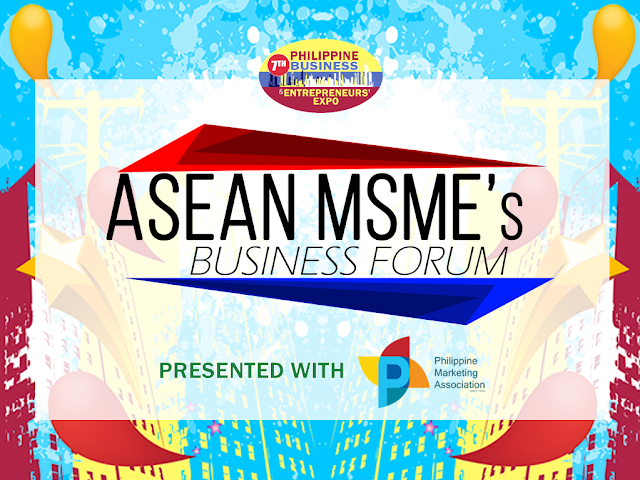 Join the ASEAN MSME Business Forum this August 26! The opening day of the 7th Philippine Business and Entrepreneurs' Expo is going to be big as the ASEAN MSME Business Forum will be held on the first day of the Expo. Witness movers and shakers in the business as they talk about relevant topics that are connected to the incoming ASEAN economic transition. Mr. Ricky Alegre from BusinessMirror will define the role of the media in the preparation to the ASEAN Economic community and Mr. Willy Arcilla of the Wong+Bernstein Advisory Group will ask us if we are ready for it. On the larger financial side, Mr. Benjie Oliva from the Philippine National Bank will discuss the state of the remittance industry in the time of ASEAN integration. On the local SME side, DTI-NCRO3 Chief Ms. Elma Viray will talk about the benefits of Negosyo Centers and why businesses need to connect to it, and the Landbank of the Philippines will discuss the connection between SMEs, the financial institutions and the inclusive growth that is the buzzword for today's changing economy. The ASEAN MSME Business Forum will take place at the seminar room of the 7th Philippine Business and Entrepreneurs' Expo inside SM Megamall Megatrade Hall 1 from 1pm to 5pm. For information on how to join, text 0920 924 2532 or send an email at info@exlinkevents.com. Seats are under a first-come, first-serve basis. Know proven strategies in improving revenue with Mr. Raymond Lim at the 7th PBEX! 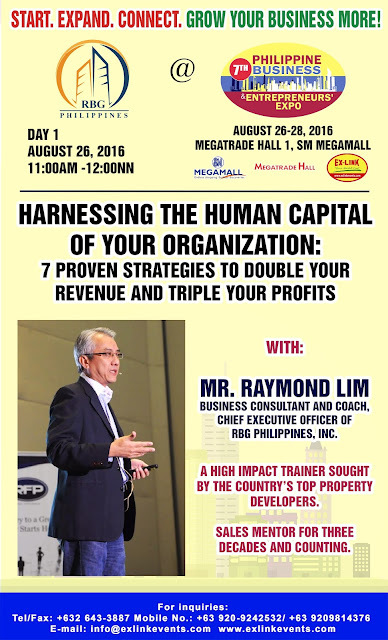 We have a special announcement for people seeking to improve their workplace - we will be having Business Consultant, Coach, RBG Philippines CEO and High Impact Trainer Mr. Raymond Lim to talk about "Harnessing the Human Capital of your Organization: 7 Proven Strategies to Double your Revenue and Triple your Profits" at the first day of the 7th Philippine Business and Entrepreneurs' Expo this August 26, 2016 from 11:00am to 12:00nn. Mr. Lim leads the Money Making Muscles series of seminars, in which he has been through parts of the country to teach people how to be their best when it comes to investing. He has been featured on ANC and the Philippine Daily Inquirer as well. Don't miss this chance - text 0920 924 2532 to pre-register. Seats are in a first-come, first-serve basis. This is made possible with RBG Philippines. The 7th Philippine Business and Entrepreneurs' Expo is organized by Ex-Link Management and Marketing Services Corporation. For partnerships, call 633-0153, SMS 0920 981 4376 / 0920 924 2532 or email info@exlinkevents.com. Follow Ex-Link Events on Facebook, Twitter and Instagram. 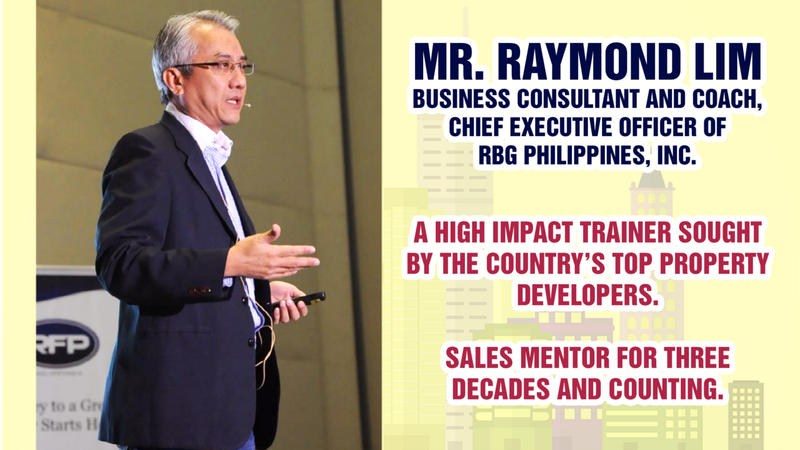 Grow Your Business More at the 7th Philippine Business and Entrepreneurs' Expo! The country's economy is changing as time goes by, and all of a sudden, we'll be part of a bigger economic community in the next few years. Unlike before, Micro, Small and Medium Enterprises (MSMEs) will now have to compete in a much larger market which also involves neighboring countries. To get ahead of the rest, you must equip yourself with knowledge in new trends going around the MSME industry, and if there's one place that we recommend you to do that, it's the Philippine Business & Entrepreneurs' Expo. The Philippine Business and Entrepreneurs' Expo (PBEX) is an event that is part of our conscious effort in cultivating and nurturing the MSME Industry. This three-day event gathers a lot of visitors, and has been running for six years and counting. This year’s event highlights various conferences that cater to the Micro, Small and Medium Enterprise industry. On the first day, the ASEAN MSME Business Forum will gather key resource speakers from parts of the ASEAN region to discuss ideas to help MSMEs expand to the region. The Business Sustainability and Resiliency Seminar will take place on the second day, covering topics related to business preparedness and how to mitigate possible business troubles. 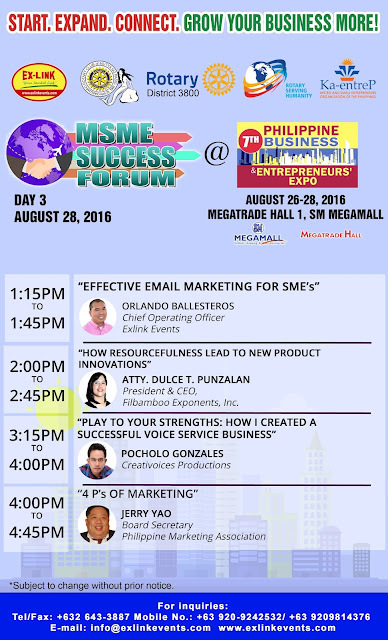 On the last day, the MSME Success Forum will gather business owners and businesses for a day of knowledge- and idea-sharing. Aside from the conferences, there will be a Business-to-Business (B2B) meetup on the first day and exhibits from different business throughout the whole expo. 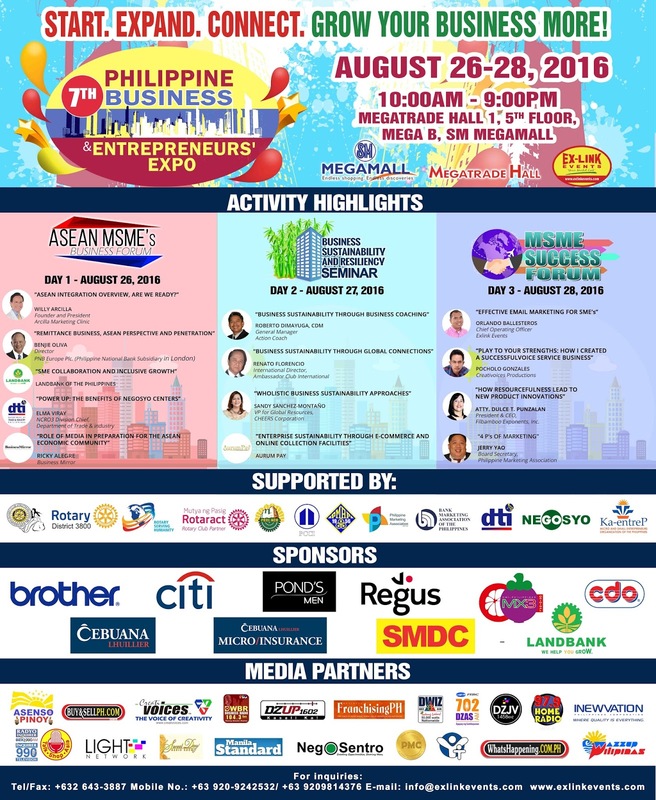 If you’re in for three days of fun activities, come join the 7th Philippine Business and Entrepreneurs’ Expo at the SM Megamall Megatrade Hall 1 in Mandaluyong this August 26 to 28. Admission is FREE, and you can register online at http://www.philippinebusinessentrepreneursexpo.com to avoid queuing and receive updates. For more information, visit the Philippine Business and Entrepreneurs' Expo on Facebook, call 633-0153, SMS 0920 924 2532 / 0920 981 4376 or send an email at info@exlinkevents.com. Just last weekend, a tornado appeared in Manila out of nowhere, swinging objects surrounding it. The residents never knew that a tornado will pass through their area - what everybody know is the strong rains that have occurred in the early mornings of the weekend. In these times, we don't know where calamities will appear - they may come while we sleep. This is the same with local businesses - go unprepared and be ready to fail fast. Let your business stay as a straw house and it will be blown away by the big bad wolf of changing times, trends and upgrades. This is why your business should be as free-flowing as a bamboo - even if it's a type of grass, it sways left and right, it's not bothered by the wind, and it's a very useful resource then and now. Good thing we have the Business Sustainability and Resiliency Seminar this August 27. This features discussions on how to make your business sustainable from various resource speakers who are knowledgeable in their fields of work. From business coaching, to holistic approaches and to financial literacy, this seminar has got you covered. If you don't want to let your business stay as a straw house, come to the Business Sustainability and Resiliency Seminar and get some bricks of wisdom to strengthen your business. 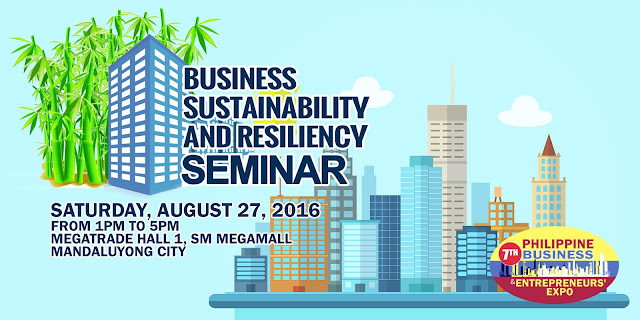 The Business Sustainability and Resiliency Seminar will be held at the Megatrade Hall 1, 5th Floor, Mega B of SM Megamall in Mandaluyong City. This is part of the 7th Philippine Business and Entrepreneurs' Expo. Follow the 7th PBEX on Facebook for updates. Want to visit the expo? Register for free! Interested in the Seminar? Register below! This event is organized by Ex-Link Management and Marketing Services Corporation. For partnerships, call 633-0153, SMS 0920 981 4376 / 0920 924 2532 or email info@exlinkevents.com. Follow Ex-Link Events on Facebook, Twitter and Instagram. The 23rd National Retail conference (NRCE) was held last August 10 to 11 at the SMX Convention Center Manila, and part of this year's NRCE is the Stores Asia Expo 2016 which is attended by delegates and visitors. The said event features exhibits from various businesses, free seminars, and the Stores Asia Hub which demonstrates the uses of the products shown in the exhibit floor. 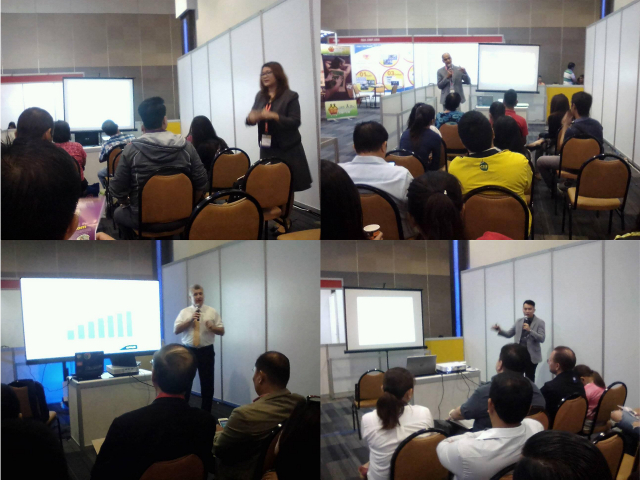 Free seminars were done throughout the course of the two-day event featuring various resource speakers. On the first day, Ms. Ilyn van Opstal of Francorp Philippines showed how to franchise in an interactive seminar where she answered questions from the curious audience, while Mr. Sandeep Walia, President of Hitachi Solutions Asia Pacific showed everyone recent retail innovations. On the second day, the APAC Sales Director of Philips Digital Displays Mr. Rob Fowler addressed the attendees "The Digital Evolution" with enthusiasm, while Mr. Michael Francis Rivera of Micropinnacle Technologies Corporation introduced Qlik which makes business intelligence easier to do and customize. All of these happened in the whole two days of the National Retail Conference. There's more retail innovations in store in the next year's NRCE and the Stores Asia Expo. The Stores Asia Expo 2016 was managed by Ex-Link Management and Marketing Services Corporation. If you would like us to manage your upcoming events, send us an email at info@exlinkevents.com or call 633-0153, 643-3887 or SMS 0920-981-4376. You can also talk to us via our Facebook page. Imagine this: You stepped in the nearby convenience store to get refreshments, and from the display you see this drink which has Nata de Coco inside it. It reads: "Mogu Mogu." You bought one, drank it, and felt the chewy Nata de Coco. Eventually, you got to taste the other flavors that they have. Feeling more thirsty now? Don't fret - Mogu Mogu has more. After launching their Pink Guava and Green Melon flavors, they launched a TV campaign and introduced the Fun Collection this year. 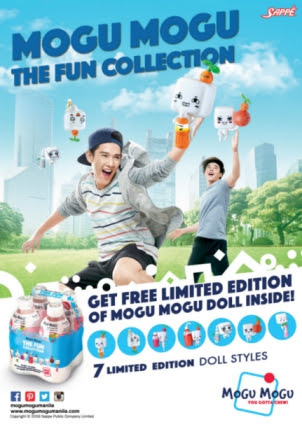 The Mogu Mogu Fun Collection gives you four (4) bottles of Mogu Mogu (320ml) and a FREE toy that you can stick in the side of your fave cup. Check out their website for the details. Cebuana Lhuillier joins the 7th Philippine Business and Entrepreneurs' Expo! Way back the old times, Cebuana Lhuillier is simply known as a pawnshop; but the times have changed and they now offer more than just the usual pawning-lending services. They offer remittance services, e-loading and bills payment and micro-insurance services as well. 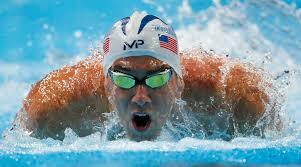 The pawnshop's innovations has made them a leader in their field. 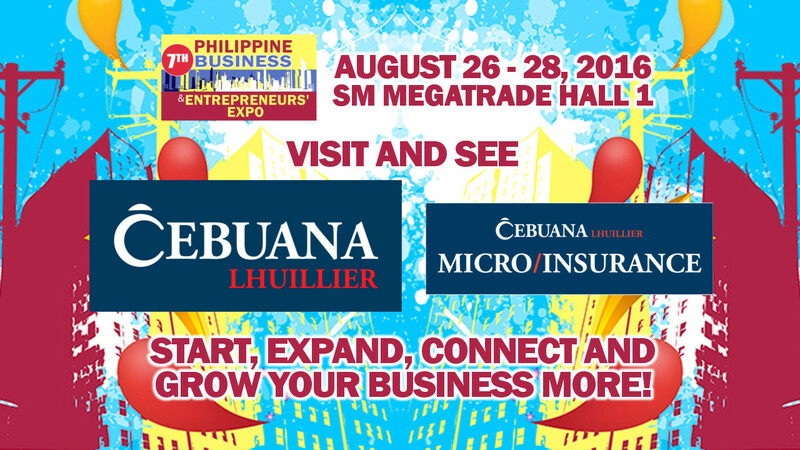 See Cebuana Lhuillier's financial services for businesses and individuals up close plus more surprises at the 7th Philippine Business and Entrepreneurs' Expo this August 26 to 28 at the SM Megatrade Hall 1 in Mandaluyong City. You can talk with fellow entrepreneurs, or just observe and gain knowledge to polish your business and expand it further.